Our homemakers oversee the home management tasks and manage domestic concerns. When you are coping with an illness, accomplishing even the basic chores at home can be demanding and risky. Possible dangers can happen anytime. 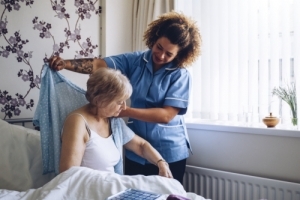 That is why aside from our home health aide assistance, we also include homemaking service to give you convenience while recovering from a certain condition. You don’t have to worry because our housekeepers are well-trained and dependable. To give you a guide, we develop a list of services covered under the scope of our light housekeeping duties. For more information, call us now at 708-801-8662. If you want us to personally come to your home and discuss your care requests with you, set an appointment now!